Read Aloud Thursday :: Mice! Time for another Read Aloud Thursday over at Hope is the Word. This is a monthly meme in which you are encouraged to share the books you've read aloud with your children over the course of the past month. It is also a useful meme in that it allows you the opportunity to collect ideas for future reads for your family. I'm so glad that Amy has kept this challenge up as it continually encourages me to keep reading aloud to my kids! What did we read together this month? Well, we started out by re-visiting Tumtum & Nutmeg . 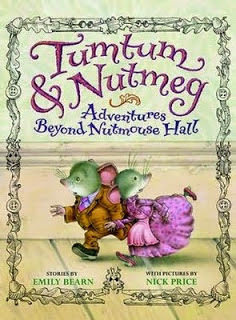 We read the first of the three books included in the title Adventures Beyond Nutmouse Hall, "Tumtum and Nutmeg". (Amazing coincidence.) 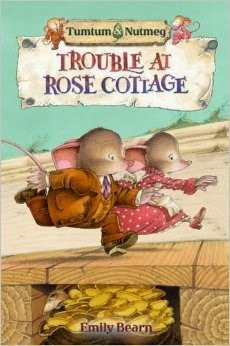 In this first story we meet our lead characters, two small mice who live in Nutmouse Hall which is located inside of Rose Cottage. Tumtum and Nutmeg share Rose Cottage with two young children, Arthur and Lucy, and their very distracted inventor-type father. Tumtum and Nutmeg take pity on the poor neglected children and determine that they will begin tending to Arthur and Lucy's most basic needs. Every night, when the children are asleep, Tumtum and Nutmeg enter their room and fix cracks in the window, mend their clothes, and generally tidy up a bit as much (as their small size allows for). The children notice the presence of their little helper, believing that they have their own personal fairy watching out for them. The children's needs become greater, and their desire for their fairy's help more intense, when their loathsome aunt comes visiting. How will Tumtum and Nutmeg manage to dispose of the aunt and restore order to Rose Cottage? Don't look at me! I'm not going to tell you. You will have to read it for yourself to find out. We've read this book before. I have raved about it before. I still mean every word I've ever said about these mice. You really ought to meet them for yourselves! Read it. You won't regret it! GLORIOUS DAY! There's been a new Tumtum & Nutmeg book released and I didn't even realize it! I have since rectified the situation. We shall meet with these mice again. Next up, the kids and I read Basil of Baker Street . I had read this previously (alone and to myself) and thought it high time that I read it aloud to the bookworms. 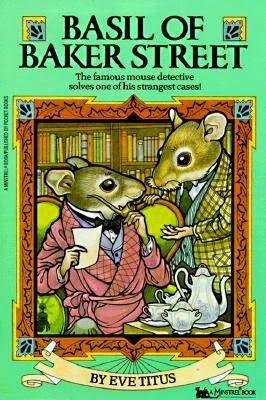 My oldest was a little skeptical because last year I introduced him to the book's Disney counter part, The Great Mouse Detective . I asked him to bear with me because while the bat is perfectly terrifying in the movie, he does not exist in the book. As I suspected, Bookworm1 thoroughly engaged himself with Basil and seemed to enjoy the read thoroughly, asking for additional chapters to be read on a daily basis until we had completed it. He is now the perfect age for it and so I'm glad that I held off on it for as long as I did. Since having read this first book for myself, I have been collecting other Basil books for us to read and I can see us poking our noses into them in short order. Bookworm2 (age 5) paid attention to the story but I think that some of the vocabulary used was lost on him. It's not bad for him to hear me read aloud, no matter what it is that I'm reading aloud, but I think he enjoyed the graham crackers he was eating while I read more than the book itself. I know that much is true for Bookworm3 (age 3). If you have a 6-8 year old who likes a spot of adventure and a little mystery, check out the Basil of Bakerstreet books by Eve Titus! Good, clean, interesting fun! To see what others have been reading with their children this month, visit Hope is the Word. Ahh! These mice stories are TOO CUTE! I loved Basil of Baker Street myself. There's more of them by Eve Titus too.